What a week: 52Quilters is continuing to grow and I've only got a few days to finish off my guest-posting before I pass the baton to the next quilter. Now that the Monday to Friday work week is over and I'm starting to unwind I've decided to spend my Friday evening in, ironing out a few stacks of fat quarters that I'll be working with this week. Are you jealous of my glamorous rockstar life? Last weekend I ventured out to Liberty's and for the first time made some fabric purchases. I love to go to Liberty and drool over the beautiful and curious things there: I've never bought fabric before, but I'm working on a little baby quilt and knew that I could stretch the budget to buy some of their tana lawn for a small project. So in honour of 52Quilters being a 'special occasion I had a little splurge and bought some fabrics at Liberty. I also had the idea to buy a diary in their gorgeous stationery section, but I overspent slightly on fabric and decided to call it day. It was nice to treat myself, but I had to limit my indulgence and keep my conscience clean! I'll share a bit more about what I bought at Liberty tomorrow when I share the progress on the quilt I'm working on. Now as for The Savoy: When I started this week, I never expected I'd find myself at a lingerie trade show at The Savoy on Friday morning, but this morning that's exactly where I was! After buying my first bottle of Flatter by Soak in Toronto, I started following Jacqueline Sava from Soak on instagram and twitter and yesterday noticed a tweet that said she was hosting a trade stall in London. Jacqueline was a treat to meet: she is very passionate about Soak and all things craft. We talked quilts, trade shows, making it as a maker, maker training and of course 52Quilters. It was a wonderful and serendipitous treat to meet a fellow Torontonian on this side of the Atlantic during my week on the '52. After our chat I headed to work, but all day I was keen to get home, change into comfy clothes and break out the iron! I decided to start with my Flatter and iron out some fat quarters I'll be using to make my 52 Quilters patchwork piece. I love the Yuzu fragrance and found it was a treat to iron with it. The spray helped me iron out those frustratingly fixed fat quarter creases and gave the fabric a fresh crispness. After trying it out on my fat quarters, I decided to try it out on the squares I've cut from my Liberty fabrics. I'll be pairing the squares I've cut above with a heavier Charcoal fabric from Oakshott (pictured next to them), so spraying and pressing with the Flatter helped make these very light cottons a bit stiffer which I think will help with when it comes to sewing them tomorrow. All in all today was a real treat. 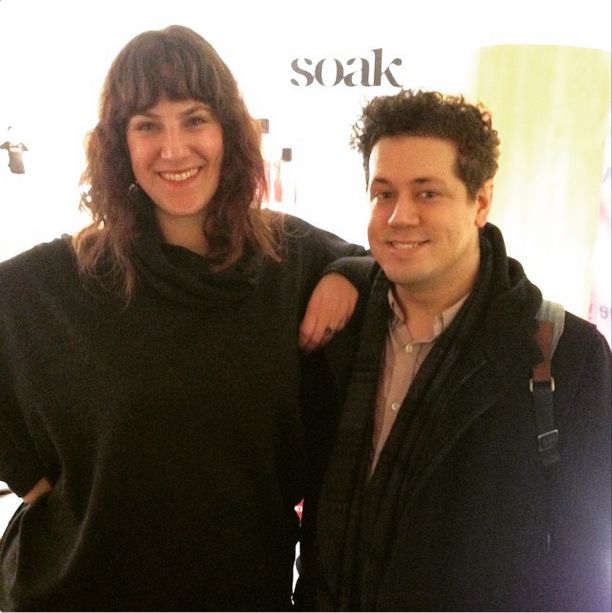 After meeting Jacqueline, I'm completely enamoured with Soak stuff. I'll admit, Flatter is not a true necessity, but I'm a very sensory/tactile person and there is something to be said for a product that can make ironing enjoyable on a Friday night. Yes, it is a luxury, but its a small one and in contrast to Liberty and the Savoy it's a luxury that is within my budget! Full disclosure: No one from soak prompted me to write this, and it was honestly 100% serendipity that I connected with Jacqueline this week... but she did generously provide me with a bottle of Fig Soak to take home and I'll probably shamelessly blog on my own blog once I've had a go with it as well. Thank you team Soak!